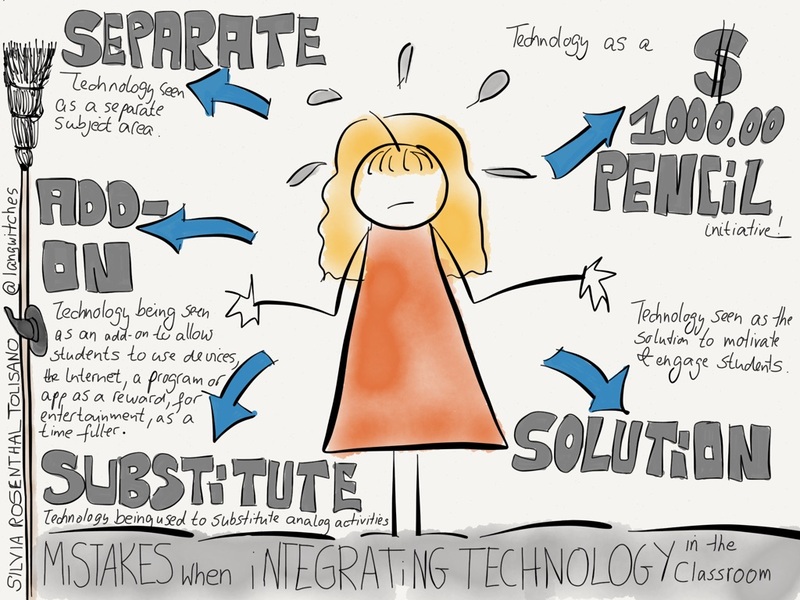 Curriculum21 — What are the Biggest Mistakes Teachers Make When Integrating Technology into the Classroom? The philosophy behind Ruben Puentedura‘s SAMR model provides an explanation of teachers integrating technology that is used as a tool substitute without functional improvement of the task at hand. Instead of requiring their students to hand in a handwritten report, they allow students to type up their report and print it out to then be handed in. Teachers seem to stay “stuck” on that level. In their mind they are integrating technology, but in reality the technology is not being used as a tool to facilitate learning or amplify learning. Teachers allow students to use devices, the Internet, a program or an app as a reward, for entertainment or as a time filler for students who finish early. Technology is being used as an add-on if there is time and in addition to the “regular” school work. Students might be asked to create a multimedia poster on a topic after they have written a report. Technology is not being used as a way through which we teach and learn, but is being seen as a separate computer class, “iPad time” or keyboarding practice. Students have to wait until they assigned rotation time in a computer lab until they are able to work on a digital project or wait until their teacher includes use of technology in their weekly schedule. Alan November in the book Curriculum21 (p.189) by Heidi Hayes Jacobs says: “The real problem is not adding technology to the current organization of the classroom, but changing the culture of teaching and learning”. November also talks about these “initiatives as “$1,000 pencil” programs“. 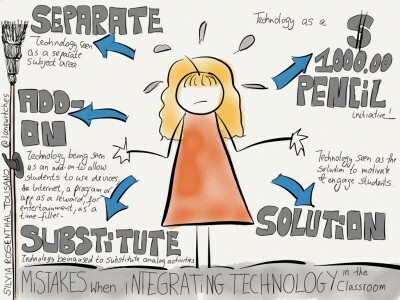 Technology is meant to aid teachers in redefining and transforming teaching and learning. Good teaching will be amplified, while not so good teaching, even with technology, will be not be so good, expensive teaching. There might be visible technology in the classroom (tablets, interactive whiteboards, smartphones, 1:1 laptop programs), but does not guarantee the use of such as a technique or strategy to facilitate learning for our students. It is a reality that more and more students seem unmotivated and disengaged in our schools. Assuming that the use of technology is the solution to this phenomenon is a mistake. While students might initially be motivated by the use of shiny devices, this quickly dissipates. Engagement does not equal learning when the use of technology is not supported by strong objectives and goals as the foundation of its use. Many students would be engaged by being allowed to use their smart phones in class. However, without a strategic pedagogical plan how to connect such use to learning goals, students might just go through the motions without ever making connections to these goals.